Speculators who bought platinum just 24 months ago have already seen investment profits up to 124%. Similar metals, like palladium, have returned even bigger investment gains up to 286%. Driving these profits, phenomenal demand from the recovering global automobile industry has conquered the attention of investors. The potential for platinum and palladium has even allured some of the biggest names in investing — including George Soros, who just upped his stake in a junior platinum and palladium stock by nearly 1,000%. Billionaire investor George Soros abruptly raised his stake on Monday in Platinum Group Metals Ltd. (AMEX: PLG and TSX: PTM), a Vancouver-based junior mineral development firm. In a filing with the SEC, Soros Fund Management increased its holdings in Platinum Group Metals from 1.5 million shares in early October to a 15.5 million share position in the company this week — a whopping 933% increase. The Soros Fund now owns 9.73% interest in Platinum Group Metals. The fund's position is currently worth $32.6 million. Platinum Group Metals controls a significant land position in the Bushveld Igneous Complex of South Africa, which hosts 80% of the world’s platinum and palladium production. The company is focused on moving its high-grade, near-surface Western Bushveld Joint Venture platinum/palladium deposit into production. 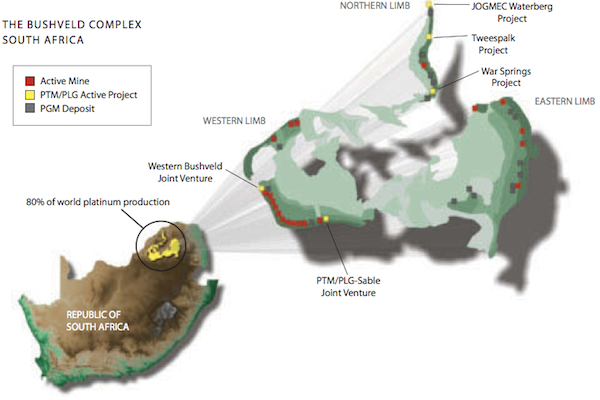 The Western Bushveld Joint Venture is a unique project, and likely to be one of the last large-scale near-surface developments on the high-grade Bushveld Complex. In Platinum Group Metals' Western Bushveld Complex, two projects contain nearly 15 million ounces of platinum group metal reserves and resources. These mineral resources are primarily platinum (64%) and palladium (26%), but also include rhodium (7%) and gold (3%). A feasibility study has been completed for the Western Bushveld Joint Venture projects. The study showed it would cost approximately $443 million and take two years to construct a mine, and another two years to ramp up production to full capacity. It is envisaged that mine construction and funding would involve both equity and debt. Last month, Platinum Group Metals announced a bought deal financing for $125 million as a first tranche towards project development. When the mine is complete, the feasibility estimated would produce about 275,000 ounces of platinum group metals for more than 20 years. Platinum Group Metals holds a right to acquire up to 74% of project. The company's joint-venture partner, Wesizwe Platinum (JSE: WEZ), holds the remaining 26% interest. The company also holds mineral rights in Canada, and has two active exploration joint-ventures with JOGMEC, the Japanese state oil, gas, and mineral company. Platinum Group Metals also owns significant mineral rights in the vicinity of North American Palladium (AMEX: PAL) Lac des Iles Mine, located north of Thunder Bay, Ontario. In addition to the Soros Fund, Platinum Group Metals counts JP Morgan, the BAC Platinum Fund, Franklin Templeton, the Canadian Pension Plan, TD Asset Management, and U.S. Global Investors among its institutional shareholders. As I mentioned before, the price of platinum and palladium has been soaring as investors prepare for heavy demand from China's booming automobile industry and cutbacks in supplies from Russian stockpiles, which many experts believe are now exhausted. The price of palladium, in particular, has also been lifted by surging investment demand, evident in the ETFS Physical Palladium Shares ETF (NYSE: PALL). 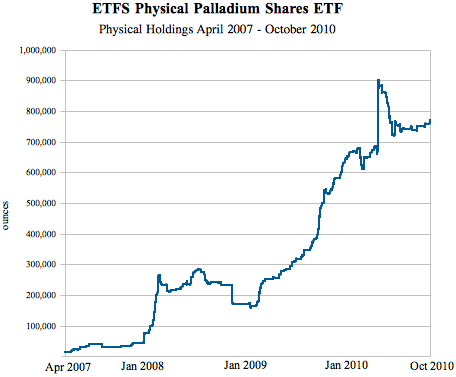 Since its release in April 2007, physical palladium holdings in PALL have increased 5,211% and now hold over $500 million in physical palladium bullion. There has even been House legislation to authorize the minting of an official U.S. palladium bullion coin. 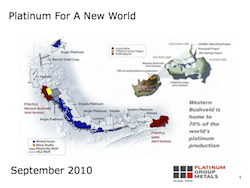 The majority of the world's palladium comes from Russia and South Africa, where Platinum Group Metals is working to develop their Western Bushveld Joint Venture. As I mentioned, Platinum Group Metals also owns mineral rights in the vicinity of North American Palladium's Lac des Iles Mine, one of the largest palladium mines in North America. Lac des Iles has 3.7 million ounces of palladium resources, and is projected to produce 140,000 ounces next year. Another large palladium mine in that area is Marathon PGM's Marathon Mine, which contains 2.4 million ounces of palladium reserves plus 3.0 million ounces of palladium resources. It was recently bought by Stillwater Mining (NYSE: SWC) for $118 million. 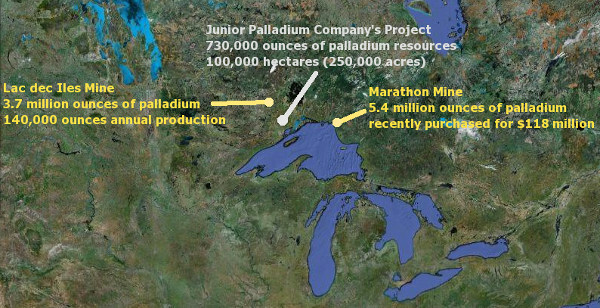 Fact is, these are two of the most important palladium mines in North America. And every domestic palladium company wants land around them. But the company is actively working to upgrade and increase its palladium resource base. The target: 2.6 million ounces of palladium-equivalent resources. And it's worth 12.6 times more than the company's current market cap. And that's just at current palladium prices! The last time palladium was entering a similar bull market, prices rapidly surged from $160 to over $1,100 an ounce — a 588% increase. Fortunately, palladium prices have pulled back quite a bit, allowing for a buying opportunity. And if we have a similar bull market for palladium, prices could hit $3,438 an ounce. With palladium prices nearing $3,500 an ounce, the investment gains from this small stock will start to increase exponentially. You can learn more about the global palladium industry — and how the auto industry's "big switch" will drive prices even higher — simply by clicking here. Editor Luke Burgess discusses global palladium supply and demand for and reveals several investment highlights for the metal. Editor Luke Burgess discusses several reasons the price of palladium appears to be headed much higher, and offers one idea on how to yield the maximum profit from palladium's bull market. Editor Luke Burgess explains why demand for palladium is about to soar, and gives readers his top North American palladium stock pick. Analyst Luke Burgess gives investors a guide to the top five alternatives to gold investment.